The main symptoms were Achilles pain in the morning, struggling to get to the bathroom which took about 30 minutes to settle down and loosen up. It could be sore after being on it for a period of time, However, it was running which was the biggest issue. Very stiff and sore to get going and took a good mile to free up. The patient was limping and was feeling aches in the other leg. After around 4 miles the tendon started to become sore and tight again and eventually made the patient stop. After a run like this, the next day was particularly difficult. The Achilles issue had started 3 months before, fairly innocuously after a simple run, possibly a bit hilly but nothing out of the ordinary. The pain developed gradually over a couple of weeks with a session seeming to be the thing that sent it over the edge. Since that session, 6 weeks before the pain was as described above and was just not changing. The patient had rested for 10 days from running but it had not seemed to make any difference. They had self-mobilised, had massages and iced the Achilles regularly, again without change. There was no history of an Achilles issue but the patient described being tight int he lower back and hip as well as the top of the hamstring for a few months. Nothing to stop then but a bit tight nonetheless. This type of presentation is typical. The first impression is of a chronic Achilles tendon strain/tear/inflammation which is likely to have been caused by an issue higher up in the pelvis or lower back. Assessment of the lower back and pelvis showed a problem with the Sacro-iliac joint which is part of the pelvis. 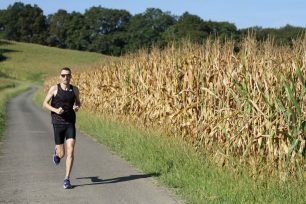 This problem will cause the leg to rotate inwards during the stance phase of the running action leading to an overload of the inside of the Achilles itself and the gradual damage to the tendon. This cause clearly needed to be treated. There was no other lower back or neural sign. This type of pelvis issue can cause weakness and lack of activation in structures like the glutes around the hip and the calf and foot stability muscles. This was seen with this patient who was unable to contract his foot and glute fully and certainly on simple things like hops showed a lot of poor control. The Achilles itself was swollen and very tender to press in the middle of the tendon. It was thickened and fibrous with a creak called crepitus. This is indicative of surrounding inflammation and the thick tendon shows there has been structural damage which is either healing or struggling to heal fully. The treatment approach was threefold. We needed to treat the cause of the issue and tackle to leg instability and strength. So we treated the back, pelvis and neural system with mobilisation techniques. This happily immediately improved the foot activation and thus enabled the patient to start properly strengthening the foot and calf. For this type of issue, we use a combination of isometric holds and eccentric work alongside numerous standard concentric/eccentric exercises to build strength around the ankle and hip as well as load the tendon to promote healing. Finally, we needed to tackle the thick fibrous tissue and stagnant inflammatory response and healing. We treated the calf and Achilles with mobilisation as well as shockwave therapy. So whilst the patient was sent away with a lot of work done and a lot of homework to do the progress was relatively quick to get the biomechanics improving. The tendon required three sessions of shockwave over 3 weeks to begin the healing process. 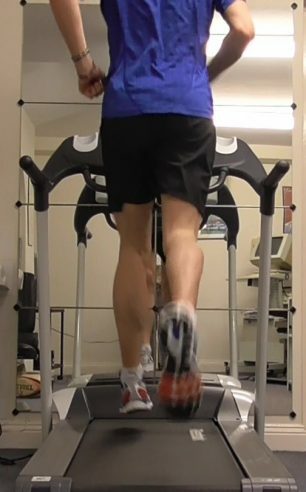 This is augmented by the isometric and eccentric loading program which stimulates the tendon repair. They are slow as there is little blood flow in a tendon so therefore little nutrient for the healing process to work with. Ref 1 and 2. Over a period of 6 weeks the pain became less, although, as ever, the early morning stiffness was the last symptom to settle. At around the 6 weeks mark the strength and control was sufficiently good to allow a progression onto more dynamic work including hopping and stepping work to promote a change in the foot landing control when running. This takes another few weeks to fully establish but by 3 months there was little symptom and mileage could build back up to 75 a week and sessions resumed. Strength work is needed to continue, as well as the biomechanics work to alter the running gait. This three-fold approach brings together the best of the science behind treating acute tendon issues in combination with work looking at the reasons why the issue started in the first place. A truly holistic approach.